Red Ramekin: Happy Blogday to Me! Ok, so I'm a little late in the posting department again, and this time it's serious: Saturday was my official blogday (blog birthday, blogoversary, or what have you)! I guess time flies when you're making sourdough starter, chilling puff pastry, and rolling stuffed grape leaves, because I can hardly believe that Red Ramekin is already a year old. I know I should have posted something special on the big day - a birthday cake or something of the sort, but I ran out of time. However, I certainly didn't forget about the big day, and took full advantage of the momentous occasion to whip up a truly delicious, only-my-blogday-can-justify-this kind of treat. Last week I was contemplating a good blogday dessert, but inspiration didn't strike until Saturday morning, when I sprang awake with the burning desire to make pumpkin cinnamon sticky buns. Oh yeah. That's what I'm talking about. 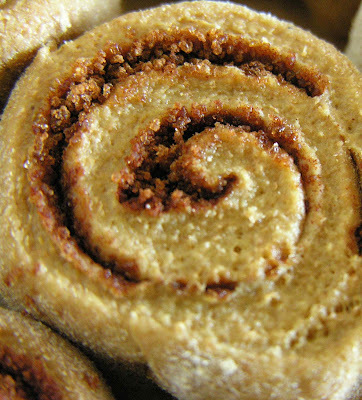 I'm vaguely familiar with the cinnamon roll process through my pesto pinwheels, which are, essentially, a cinnamon roll's sophisticated older cousin. Blogdays require sweet treats, though (just take my word for it on this one), and autumn, of course, requires that everything I bake contain pumpkin. So pumpkin sticky buns it was. I started with a pumpkiny yeasted dough (enriched and whole wheat), and finished with a melty, gooey, mixture of butter, honey, brown sugar, maple syrup, and pecans (calm down, I didn't say to make these every day!). Some of the buns I left goo-free (plain old cinnamon buns), but the gooey ones - oh baby. Even though I had intended them to be part of a decadent brunch, they served me well for dessert on Saturday night (and for a guilty Sunday morning snack). I'm already looking forward to the next time I happen to be entertaining for brunch. 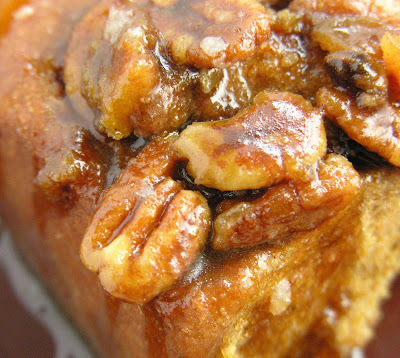 These sticky buns would be a real show-stopper (and frankly, I'm not going to wait until my next blogday to make them again). I'd like to share the recipe, but it was really just a mish-mash of other recipes that I found in various places around the internet. First I came up with a recipe for yeasted pumpkin rolls (not too sweet, not too buttery), and then I followed some basic sticky-bun procedure to make filling and the gooey topping. Really, you can't mess up when the main ingredients are butter, sugar, and honey. Trust me. So, when you get tired of the standard Sunday muffins or coffee cake, or want a new and delicious sweet treat, or happen to find yourself hungry on your own blogday, give these a try. Yum! Putting together a mish mash of recipes is what makes it yours. It is also probably what made it so wonderful. So, please, share. For the filling, melt 1/2 stick of butter and mix some cinnamon and sugar. For the topping, melt 1/2 stick of butter in a skillet with 3tbs. 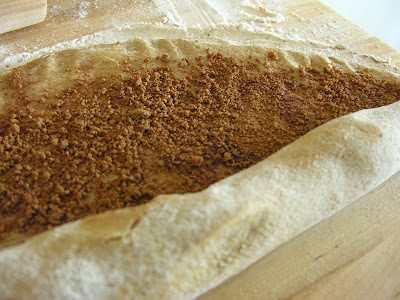 brown sugar, 1 tbs. maple syrup, and 1 tbs. honey. Add pecans or diced apples, if you want. how creative! do you think it'd work with other winter squash -maybe acorn? just stumbled across this blog via cave cibum and I'm so glad I did -love your content and presentation! and happy blogday! Claire: I'm sure any type of squash would work, as it's just an addition to a relatively normal enriched yeast dough, but do be careful about any excess liquid in the squash if you prepare it yourself. I always find the canned stuff more concentrated and less watery than what I prepare myself, so adjust the amount of milk in the recipe accordingly. your blog and i have the same birthday! happy blogday! Dad and I are free for brunch! Happy Blog Day (even if it's late!) !! There is pumpkin all over the blog world right now. I must say, these rolls are moving towards the top of my pumpkin list! Just lovely!